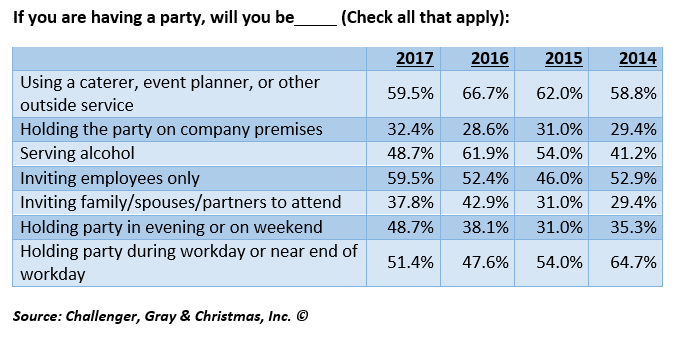 2017 Holiday Party Survey Report: Companies Plan Less Showy Shindigs | Challenger, Gray & Christmas, Inc.
As the year comes to a close, human resources executives across the country may feel some trepidation regarding the annual company holiday party in the face of numerous reports of inappropriate sexual contact occurring in the workplace. These fears may explain the scaled-down fetes employers are planning this year, according to a new survey released Tuesday by global outplacement consultancy Challenger, Gray & Christmas, Inc. According to the annual survey on holiday party plans, conducted in October and November among 150 human resources representatives across the country, nearly 80 percent of companies plan to host holiday parties this year, approximately the same as last year. 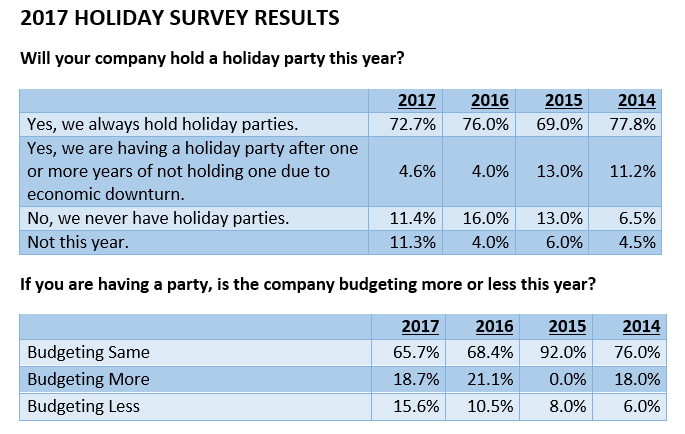 However, 11 percent of employers will not hold a holiday party this year after holding them in the past, up from 4 percent in 2016 and the highest percentage since 2010, when 24 percent of companies did not have parties. Just over 15 percent of companies will budget less for these affairs, up from 10 percent in 2016. Moreover, fewer of these parties will serve alcohol, use caterers or other outside services, or invite guests of employees to attend. “One way to create a safer environment is to limit the guest list, hold the party during the workday, and avoid serving alcohol,” added Challenger. In fact, 48.7 percent of employers will serve alcohol this year, down from nearly 62 percent of company parties that offered alcohol service in 2016. Last year’s total was the highest percentage of employers serving alcohol since Challenger began the survey in 2007. Meanwhile, 37.8 percent of companies will invite spouses, partners, and friends to attend the company soiree this year, down from 42.9 percent in 2016. Just under 60 percent of survey respondents said their companies are hiring caterers or event planners, down from 66 percent last year. Nearly one-third of companies are keeping the party on company premises compared to 28 percent last year. Additionally, more companies are holding the party during the workday: 51.4 percent in 2017 versus 47.6 percent last year. This scaling down does not appear to be due to diminished confidence in the economy. Nearly 48 percent of employers said the economy is better than last year, while 43 percent said economic conditions are the same as last year, according to the survey. “It’s very possible the results we’re seeing are due to news reports of sexual harassment and assault at work. The company party is a way for employers to celebrate the accomplishments of their workers. It should boost morale and let workers know they are valued. It should not put anyone in an uncomfortable situation,” said Challenger. Do not overdrink: Free alcohol can quickly lead to excessive drinking, which can then lead to embarrassing behavior or worse. Stay in control. Do not let your alcohol-induced actions get you in trouble with your company or the law. Do not talk business: Save your new business idea or customer complaint for the next workday. Learn more about the interests of your co-workers or managers outside of the office. That personal connection will help you when you bring up that new idea, and it could help when it comes time for salary reviews. Arrive early: This may be your best opportunity to talk with senior executives while things are still relatively quiet. Work the room: It is easy to simply socialize with the members of your department, with whom you work day in and day out. However, it could be beneficial to use this occasion to meet people in other departments. Use the opportunity to network within your organization. Attend other companies’ parties: 38 percent of company parties allow friends and family to attend. This is a great opportunity to expand your professional network.